It's hard to believe that America's best-selling cookie is vegan. That's right: Oreos are vegan. Sure, they aren't anything close to being a nutritional powerhouse, but sometimes you need to indulge a little. In this recipe, Oreos are paired with another classic American dessert to take the cookie to another level. These cookies are pretty easy to make, albeit a little messy (Oreo crumbs everywhere, hello). It consists of only six ingredients, half of which you probably already have at home, and half that you'll need to stop by Whole Foods to pick up. If you're concerned with the nutritional qualities of regular Oreos, you can easily substitute something like (although you won't have that true Oreo taste). The key to these cookies is to just slightly underbake them. They should be puffy when you remove them from the oven. There shouldn't be any golden color on the edges, and the tops should be just set. Don't worry, they'll continue to "bake" on the hot baking sheet once removed from the oven, as most cookies do. They will firm up as they cool, but they'll remain slightly doughy in the middle with chewy edges. The cookies are buttery, rich, and sweet, and believe it or not, they really are very similar in taste to an Oreo cheesecake! This is why the underbaking is important: you want them to have that creamy rich center. The original recipe only consists of Oreo crumbs on the outside of the cookie, but I took it a step further and added Oreo crumbs to the dough for extra Oreo-ness. Eating these while still warm is absolute heaven, but they will keep for about 2-3 days in an airtight container. Anything after that still gives you a delicious cookie, but they do get stale quickly. So eat up! Preheat oven to 375. Spray two baking sheets with cooking spray. Set aside. 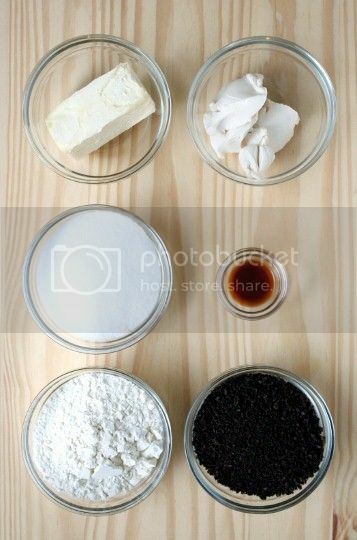 In a food processor, add Oreo cookies and process into fine crumbs. Set aside. In a large bowl, cream the butter and cream cheese using a mixer until light and doubled in volume. Add sugar and vanilla, and mix until well combined. Add flour and 1 cup Oreo crumbs, and mix by hand until just incorporated. Refrigerate dough for about 30 minutes. In a shallow bowl, add remaining Oreo crumbs. 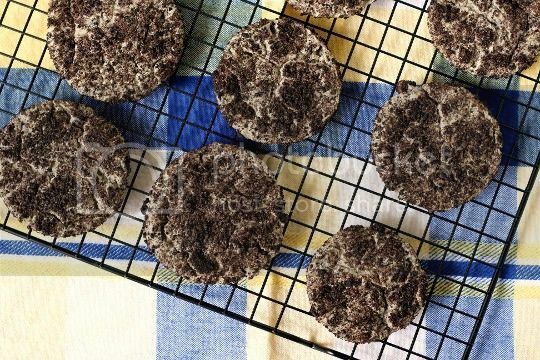 For each cookie, take a golf ball-sized amount of dough, roll into a ball, and roll in Oreo crumbs until completely covered. Place cookie balls onto prepared baking sheets. Bake for 12 minutes, or until puffy and set. Cool on pan for 3 minutes before transferring to a wire rack to cool. Store in airtight container. Makes about 24 cookies. Nutrition data (per cookie): Calories 137, Fat 6g, Saturated Fat 3g, Sodium 86mg, Carbs 19g, Protein 1g. Yum ! These look so delicious...! Do you press the cookies down on the cookie sheet or leave them like balls? Keep them as balls, they will flatten out as they bake. Technically, Oreos aren't vegan - if you like to avoid sugar processed with bone char. By virtue of what's listed on the label, the cookies are considered vegan by many. Some people feel the use of bone char a non-issue since actual animal bones aren't in the final cookie. Others say it's an issue that animal products are used at all in the production of Oreos. Really, though, it's up to each person to decide where they draw their own line regarding the consumption of sugar processed with bone char. Some city water supplies are also processed with bone char, so I hope you avoid water as well, if you're actually committed to that stance. Nitpicking at things like bone-char does nothing to help animals; it just makes veganism seem impossibly difficult to the population at large, when it's certainly not. I suppose if you're vegan to maintain some sense of superficial personal "purity," then you'd care about sugar processing techniques, but I don't know anyone like that, and there's no reason to encourage such behaviour. However, if you're vegan because you don't want to intentionally support oppression and you want to improve human treatment of animals, obsessing over minutiae that animals aren't being raised and killed for is a non-issue; avoiding these byproducts does nothing to curb oppression or suffering since the byproducts exist only because of animals being used for food and fashion. As support for factory farming decreases, the animal byproducts made artificially cheap by it will rise in cost and their use in tangential industries will naturally subside, to be replaced with cheaper non-animal alternatives. What an excellent, reasonable and sound response! I agree that nitpicking solves nothing, instead, I find it more useful to share other, healthier options with people. These did not turn out for me. They didn't flatten or spread at all. Usually when cookies don't flatten, they're too dry or contain too much flour. How did you measure? OMG. These are the BEST cookies I have ever had. There is no way that anyone could tell they are vegan. So I decided to make 3 batches and share :) Thank you SO much for this recipe!!! They turned out beautiful and delicious! Must be a cookie-baking kind of day ... I just made a batch of these too and thought they were fabulous. And they're so rich that my husband and I can actually avoid nomming the entire batch at once. Can't imagine that they won't be a hit with my omni friends. Thanks for sharing the recipe! And regarding the above discussion, Oreos are on PETA's "Accidentally Vegan" list. If Oreos are vegan enough for PETA, they're vegan enough for me. I just made them and they're delicious! 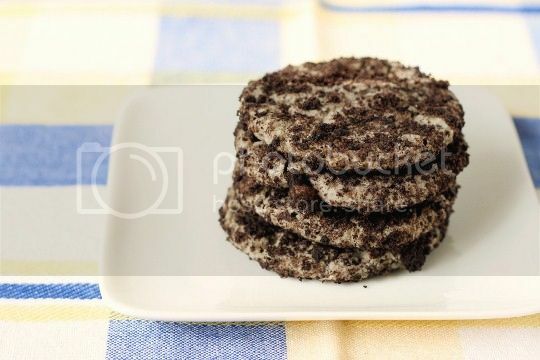 I really like how they're rich and almost a bit crunchy from the oreos (it's hard to grind oreos when all you have is a spoon and a bowl) but its just so great. Thanks for the awesome vegan recipe! I didn't even have enough veg cream cheese but it's nonetheless awesome! It's hard to find non-dairy cream cheese in australia so i didn't use it, and instead mixed in a little rice milk to make the batter creamier. I also mixed in some dark chocolate (dairy free of course) choc chips. I didn't use a small cookie cutter and rolled them by hand so my batch only made 14.
definetly going to make them again!